We welcome applications from prospective graduate students and postdoctoral scholars. Students and postdoctoral scholars can choose to be individually or jointly mentored by faculty members across departments, for a unique training experience that straddles disciplinary boundaries. Details on requirements and how to apply are given below. Environment: The University of Texas at Austin has excellent programs in Computer science, Engineering, Pure and Applied Mathematics, and the Biological Sciences. CTCN members enjoy collaborative interactions with members from several of these departments. 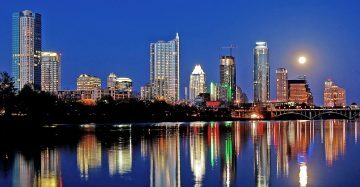 Austin is the 11th-largest and fastest-growing large city in the US.Austin was ranked as the #1 city to live in the US by the US News and World Reports in 2017. It is home to a high density of technology and Fortune-500 companies. It is the founding home of Dell Computers and Whole Foods. Austin supports a thriving live-music culture, extensive outdoor facilities for sports and a year-r ound climate conducive to their pursuit. The CTCN invites applications for postdoctoral research positions in collaboration with a network of experimentalists from UT Austin, as well as national and international collaborators. Candidates with a Ph.D. in Physics, Mathematics, Computer Science, or other quantitative field; expertise in nonlinear dynamics, statistical physics, machine learning, or information theory; and a strong record of creativity in their past work are particularly encouraged to apply. It is desirable but not required, that candidates can demonstrate an investment in learning about Neuroscience. Salary will be competitive and commensurate to the candidate qualifications. UT Austin is an equal opportunity employer and promotes academic strength through diversity. We are sensitive to the needs of dual-academic and dual-career families. Applicants should submit a curriculum vitae, a list of publications, a brief description of research interests to to the CTCN website, and arrange for three letters of recommendation to be sent directly to the faculty member of primary interest. Inquiries may be addressed to thibaud@utexas.edu or ilafiete@mail.clm.utexas.edu.